It has been a long busy week for me. I feel so out of touch with all of my blogging friends! Work has taken over and I'm juggling having one child home from college and one high schooler who is bored already! It's all good though, I'm not complaining (much). I am still trying to finish up all the custom quilt orders and can finally see a light at the end of the tunnel. I keep wondering why I do this to myself, but I do love to create something special for someone. So why all the photos of lemonade? Well, it's sets the standard for summer refreshment (with iced tea being a close runner-up, in my opinion). I've been experimenting with many different recipes as of late. 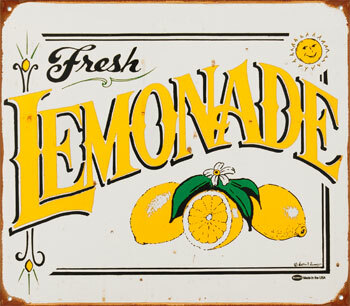 I love all the summer images that the word "lemonade" evokes. So today, during a little downtime, I'm going to pour myself a tall glass and visit your blogs. Hope to "read" you soon! Blessings! 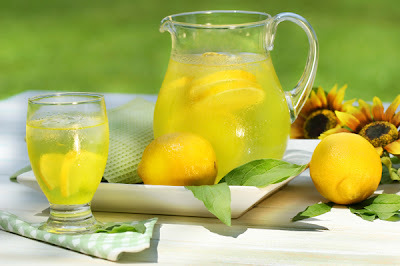 I loved the photos of lemonade! It does remind a person of summer and summer fun! It looked quite refreshing too!! Lemonade does say summer and your pictures bring memories of summers past. I know what you mean about needing to catch up with bloggers. That was my goal this morning too. Glad I stopped by here first. Lemonade is my favorite beverage during the summer. 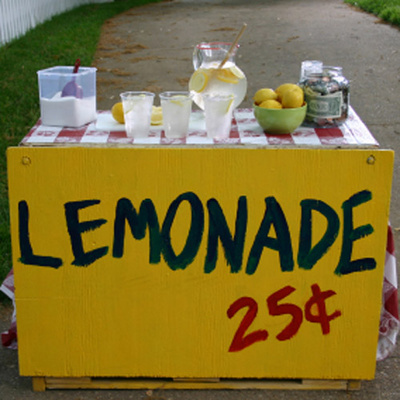 Lemonade stands have a special place in my heart - my boys had one when we lived on a cul-de-sac a few years ago. Such fun!! Once again, you have brightened my day with a beautiful picture and post. Somehow that little lemonade stand just brought me a little bit of sunshine to an otherwise dreary, rainy day here at home! "You are my sunshine, my only sunshine, you make me happy when skies are gray". Thank you! Loved your pictures. I love lemonade. I really love Chick-fil-a's lemonade! Hmmm, think I will go get me one. Lemonade is my all time favorite drink! I can drink it anytime of the year but I love how it screams summertime too! Good luck finishing up your orders...its good to have them! Oh JOY...when I see the lemonade I know Summer is here. HUGS my sweet friend...loved this post! Lemonade is the perfect summer drink!! Hope your quilts are finished soon so you can relax and enjoy your kids! I love anything lemon, so these pictures make me swoon! !